After watching such highbrow fare as The Tree of Life and Hobo with a Shotgun, I felt the need for something light, so I went to see X-Men: First Class. I have to admit that I was never really into the whole X-Men thing. I belong to a generation for whom Spiderman and the Fantastic Four were the really cool superheroes. So I probably didn’t get all the in-jokes, although I noticed some moments that clearly had that in-joke feel to them. Personally, I don’t like it when they put in-jokes in movies, but they seem to be a requirement with these genre films. X-Men: First Class gets off to a slow start. The problem is that it spends too much time establishing the origins of the main characters. About twenty minutes in, however, it starts to take off, and soon it’s like a roller coaster ride. I won’t go into too much detail about the story. Basically it takes place in the early 1960’s, and it’s about a group of evil mutants who try to start a nuclear war between the United States and Russia. They want to destroy non-mutants so that they and other mutants can rule the world. 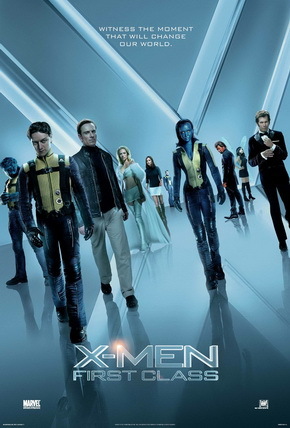 They are opposed by a group of good mutants, who at the end become the “X-Men”. As you may have guessed by now, the words “mutants” and “mutations” get tossed around a lot in this film. I guess this is supposed to sound scientific, although I’m not aware that it’s possible for a mutation to allow one to violate the laws of physics, as the characters in this film frequently do. One of the things I liked about this film is that some of the characters are remarkably complex for an action movie. Indeed, the characters in this film have more depth than the characters in some supposedly “adult” movies such as Horrible Bosses. Even though they have super powers, they can't help feeling like misfits who aren't wanted. I suspect this is the secret to the comic books' success: they appeal to adolescents who feel they aren't appreciated for their talents. This film mixes historical events with fictional ones in a manner that I did not find objectionable. Indeed, I was struck by the fact that the movie makes it clear that it was the U.S.'s decision to place Jupiter missiles in Turkey that led to the Cuban missile crisis. When I was young, if you had pointed that out to someone, he might very well have called you a "traitor". It's funny how things have changed since the end of the Cold War. This entry was posted on August 13, 2011 at 5:57 am and is filed under Cinema, Comic Books, Popular Culture, Superheroes. You can follow any responses to this entry through the RSS 2.0 feed. You can leave a response, or trackback from your own site. I saw one of the early X-Men movies. I remember it being good. Taking time at the start of a movie, to introduce characters, is standard screenwriting. I will introduce my new blog soon. It will be more focused, and geared for 2012 elections. In the mean time I have a new movie blog here. The new blog looks good. I can’t wait to see ‘Tabloid’.